Tuna are opportunistic eaters that adapt to the food available in its current environment. Although there are many types, four of the most common species of tuna include Bluefin, Yellowfin, Albacore and Bigeye. Each of these species employ sight, rather than smell or hearing, to successfully hunt and attack sources of food. Bluefin Tuna, with their large size and quick aggressiveness, consume a variety of prey. 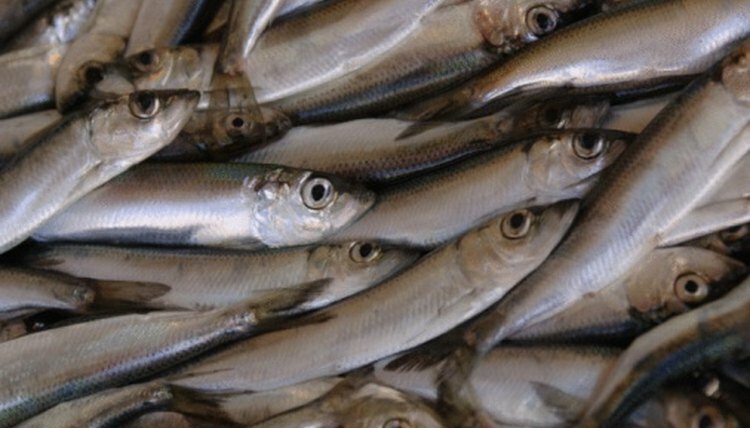 Common food sources include herring, sanddabs, anchovies, mackerel, flying fish, squid, shrimp, eels, and surfperches, as well as smaller tuna. This species tends to hunt at dawn, midday and dusk. A study by the University of Palermo showed the size and age of the Bluefin as a direct correlation to the size of prey it pursues. Yellowfin Tuna tend to find their prey in deeper ocean waters, although they have been known to feed near the surface as well. As such, the majority of its food consists of octopus, dolphin, squid, lobster, and other tuna. Yellowfin also eat anchovies, pilchards, and pelagic crabs. According to the National Aquatic Resources Research and Development Agency, a particular species of pelagic crab, C. smithii, is the most successful form of bait for Yellowfin Tuna. The diet of Albacore Tuna varies depending on their location. They can be found near the surfaces of shallower waters abundant with smaller prey, but they do not feed on parasites or microscopic organisms. Little is known about the diet of Albacore Tuna because they are difficult to keep in captivity. However, fishermen have found success catching Albacore with small baitfish. Shrimp-like and crab-like animals have also been found in their stomachs. Bigeye Tuna tend to prey indiscriminately on any smaller fish within proximity. Bigeye Tuna that feed near the surface prefer squid and crustaceans, while those in deeper waters consume cephalopods and mesopelagic species of fish. Near Southeast Asia, this species feeds predominantly on oceanic squids and ray-finned fish, according to the Indian Ocean Tuna Commission. What Kinds of Animals Eat Sea Anemones?